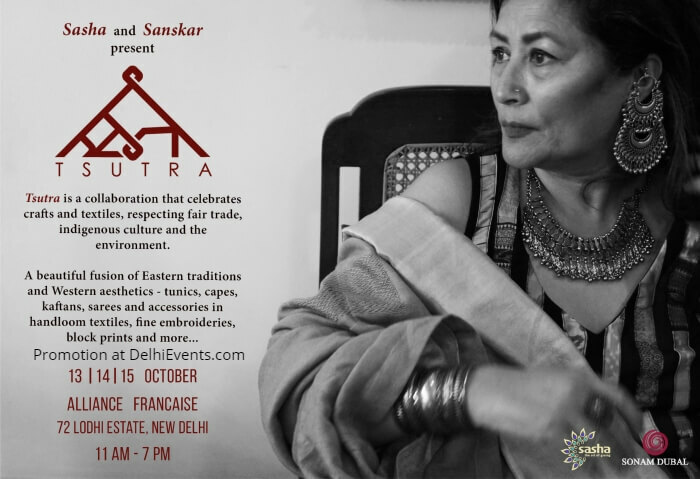 a sustainable collection celebrating the rich culture of indian heritage and contemporary design respecting Fair Trade values. About the Organisation : Sasha is a not-for-profit organisation working with more than a hundred artisans and craft communities all over India. Since its inception in 1978, Sasha has worked towards developing craft communities so that their skills and creativity find expression, recognition and fulfillment. Sasha has been working with artisans and craft communities to bring you authentic hand crafted products and we are now proud to be a guaranteed fair trade organization.Sasha works intensively to demonstrate and instil the Fair Trade standards of equity, transparency, capacity building, empowerment, social security and environmental sustainability at all levels of its supply chain. ‘Sanskar' label by a leading fashion designer Sonam Dubal is a 15-year odyssey of design interpretation inspired by Buddhist heritage, delicately fuses Eastern traditional styles and western aesthetics in his work .